It's ironic how I'm saying goodbye to Dubai, our home for 8 years as a family (and much longer for me), sitting here in India quite some while after having left the UAE. I think the reason it took me so long to write this is because it is hard to let go of a place like Dubai. A place where my two children were born. A place where we have so many memories of Little Dude's childhood, of many beautiful places visited, of so many hopes and dreams. 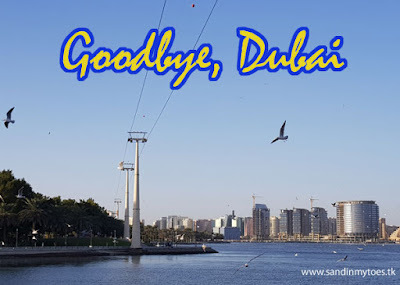 All of my motherhood experiences manifested in Dubai and that is also how this blog was born. Sand In My Toes is about me testing my toes in the sea of parenting, and also about my experiences as an expat in the desert city. I don't know how I feel about having left all that behind, returning now to a home that is familiar and yet so unfamiliar at the same time (because, I myself, was raised an expat child and never quite lived in India). I am not angry, but a little heartbroken even though we knew we would have to leave. We are expats after all. At the moment it feels hard to go back and look at all our representations of life in Dubai, whether through souvenirs, presents, this blog, or my Instagram pictures. It still feels like we belong there. Which is why, I'm taking a little break from this blog and social media. On the bright side, our expat journey is not quite over. We plan to start a new life in the Kingdom of Saudi Arabia soon, which may open a new chapter on this blog. Tarana, I hope you are well. Haven't seen anything from you lately. God bless and all the best!